Ramadan is the ninth and most important month of the Islamic calendar. The month is a religious celebration for the lunar period in which the Prophet Muhammad received his first revelations. During this sacred religious celebration, the entire city of Dubai slows down and focuses on reflection, refreshment and growth as well as increasing their time spent in prayer. Ramadan is one of the five pillars of Islam (1.4 Sawm: Fasting) so fasting plays a big part in way the Muslims recognise the celebration. Everyone in Dubai, Emiratis and tourists alike, are to respect this act and those participating, regardless of their faith. This means that during daytime hours of Ramadan (after sunrise and before sunset) eating, drinking, smoking and even chewing gum in public areas is prohibited. It’s not all about fasting and prayers though. Muslims recognise Ramadan through acts of charity and empathising with those less fortunate. Since Ramadan is based on the Islamic calendar, there is no specific dates. The Islamic calendar determines the first day of each month by the new moon. The exact day that Ramadan starts is when the new moon of the ninth Islamic calendar month rises, which usually occurs around May 26th – June 24th. This being the case, Ramadan is generally announced the day before it begins and lasts for around 29 – 30 days or until the next new moon. Where can we get food during the fasting times? We know what you’re thinking… A majority of the city is fasting and you’re not allowed to eat or drink in public so what’s the chances of finding a restaurant that’s open for lunch? Surprisingly, the chances are pretty high! Most of the restaurants offer business as usual during Ramadan. The only difference being the closed blinds shielding diners from the public view. If they aren’t open for dining, it’s likely they’ll be taking delivery orders for you to eat a meal in the privacy of your hotel room. Can visitors get involved in Ramadan? Regardless of your faith, tourists are welcome to participate in the celebrations of Ramadan. Fasting is not required for non-Muslims however you can try fasting for a day if you wish! Of course, fasting isn’t the only way you can get involved during the day. There are countless government setup initiatives for you to help the less fortunate. There are lots of ‘sharing fridges’ scattered across the city that are an easy way for tourists to give to less fortunate. Simply put some food or drinks in one of the fridges and help feed hundreds of hungry workers! Before the sun rises and after it sets, the fast is broken and the people gather in many different places across the city for a festive gathering with feasts and celebrations. Suhoor is the feast that occurs in the early hours of the morning before the fast begins. It ensures that those participating in the fast have enough sustenance to get through the day ahead. Some of the best Suhoor’s in Dubai include The Majlis at Dubai World Trade Centre, Le Patio in St. Regis Dubai and Sultan in Jumeirah Zabeel Saray. Iftar’s are the evening equivalent to Suhoor’s. The city comes to life after dark. Malls extend their opening hours, there’s a range of events and entertainment and the Iftar’s kick off. Some head to the decorated Ramadan tents where there’s special Iftar buffets for fasters. Some of the best ones in Dubai are Ewaan at The Palace Downtown Dubai, Dubai Creek Harbour Ramadan Tent and Asateer at Atlantis, The Palm. The Dubai World Trade Centre hosts the Ramadan Night Market for 10 days during Ramadan where you can find bargains on all sorts of goods, from fashion to electronics and more. 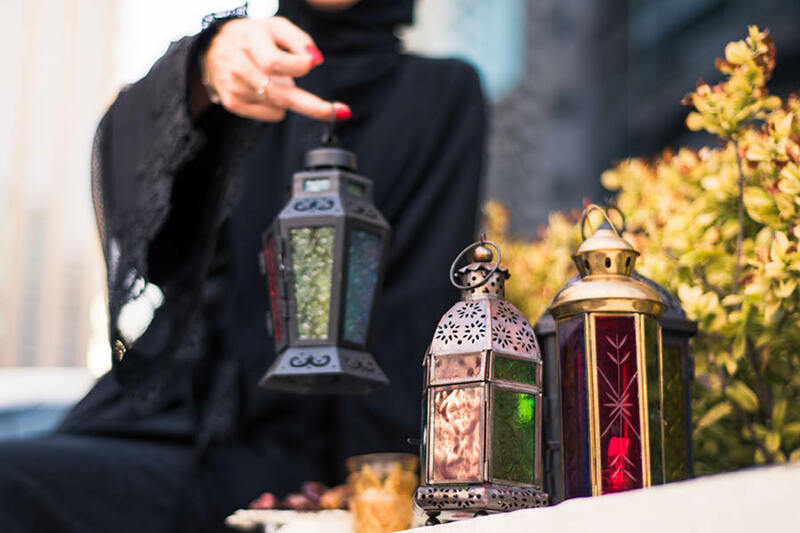 Ramadan Nights at Rise operate every evening of Ramadan with a combination of Iftar buffets, music and entertainment, creative workshops and shopping. The opportunities for visitors to participate in Ramadan are endless! From the Arabic language, Eid al-Fitr translates to ‘the festival of breaking the fast’. It’s celebrated as the end of Ramadan and signals the beginning of the next Islamic calendar month, Shawwal. Eid al-Fitr is a time for the Muslims to spend quality time with their friends and families and reflect on the past month of Ramadan. It is also a time, just like Ramadan is, to give to the less fortunate by donating to the poor, exchanging gifts and wishing everyone an ‘Eid Mubarak’ (Blessed Eid in English). While most of the first day of Eid al-Fitr is spent at home, the whole city of Dubai comes alive in the evening. Malls and restaurants have their doors open, there’s performances in major public places and there’s even a firework display! Thinking of travelling to Dubai for Ramadan? Contact the My Dubai Holiday Experts to discuss the best holiday package for you!